Even as US environmental regulators are reluctant to declare fracking a widespread water pollutant, a new study of water in Texas’ Barnett Shale area reveals "incredibly alarming" levels of contamination, with fracking the prime suspect. The University of Texas at Arlington's study of the groundwater near the Barnett Shale — which underlies about 5,000 square miles of North Texas, including Fort Worth — is being called one of the most comprehensive of its kind. While the study does not claim to definitively establish fracking as the source of groundwater contamination, it does document a strong association, and says the findings should "be an impetus for further monitoring and analysis of groundwater quality." The results of two years of tests, published Wednesday in the trade journal Environmental Science and Technology, show groundwater contamination with "multiple volatile organic carbon compounds throughout the region, including various alcohols, the BTEX family of compounds and several chlorinated compounds." The study's lead author Dr. Zac Hildenbrand told WFAA News that all the chemicals found are associated with the fracking industry. "When you find a BTEX compound with a chlorinated compound with an anti-corrosive agent all in the same water well, it's pretty shocking evidence that there's been a problem," said Hildenbrand. "The only industry that uses all of those simultaneously is the oil and gas industry." 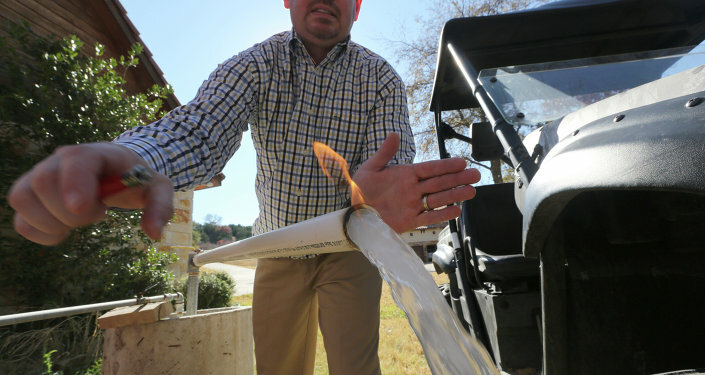 The researchers collected water samples from 550 water wells across 13 Texas counties in the Barnett shale area. "The conclusion we can make is where there is more drilling there is more abnormalities in the water," Hildenbrand said. The oil and gas industry has been quick to point out that correlation is not causation. A study of 550 water sample from aquifers above the Barnett shale in Texas found elevated levels of chemicals associated with hydraulic fracturing, and although they can't definitely prove causation, researchers say they were "incredibly alarmed" to find elevated levels of carcinogenic chemicals, including benzene. "The authors specifically say that they cannot link contamination to unconventional oil and gas activity. Activist groups and some media are trying to manufacture a fracking link that the data don't definitively support," Dave Quast with the oil and gas industry advocates Energy In Depth told WFAA. UTA associate chemistry professor Kevin Schug denied that the study overstepped the bounds of objective research, and said he hoped it would be used to pinpoint what part of the fracking process may be causing contamination. "It's our job to remain balanced and report what we found in an objective, scientific fashion and the fact of the matter is that many of these compounds are in some way associated with that process," Schug told the Fort Worth Star-Telegram. The EPA report — while it recognized instances in which fracking has caused water contamination — was careful to deny they had found evidence of "widespread" contamination. "I would argue that 550 wells over many square miles meets any reasonable definition of widespread," Alan Septoff, strategic communications director for the environmental group Earthworks, told the Star-Telegram. "It is not pollution from one well, but it is pollution from many wells." Water samples were taken from the Trinity and Woodbine aquifers, which sit above the Barnett Shale. There are more than 20,000 hydraulic fracturing or "fracking" wells in the area, which inject a mixture of water and chemicals at high pressure into rock formations to break them apart and release oil and gas. The 550 samples in the UTA study were taken from 350 residential water wells, 59 well used for agriculture, and 141 municipal or public wells serving the Dallas-Ft.Worth area. The results showed elevated levels of 10 heavy metals and 19 different chemical compounds including what is known as BTEX, or benzene, toluene, ethyl benzene and xylenes — chemicals used in oil and gas processing. Of particular concern were a handful of samples where the levels of benzene exceeded EPA safety limits. Methanol and ethanol — used in fracking as anti-corrosive and gelling agents — were also present at elevated levels. "These compounds are carcinogenic," Hildenbrand said, calling benzene "a nasty, nasty chemical. You wouldn’t want to be drinking any amount of that."